Do you have a missing tooth or missing teeth that is causing you some problems? Do you avoid going out or are you embarrassed to be around anyone but your closest loved ones? Do you find you are speaking differently because you have missing teeth in your smile? You may find that you have some teeth that are getting more worn down because you are chewing on them to compensate for the gaps in your smile. There are several options to restore your smile at our Derry NH office near Londonderry and Windham NH. One of the most effective, long-lasting choices is dental implants–a marvelous implant dentistry procedure that can give you back your smile, and your life! Implant dentistry is what is used for placing dental implants. 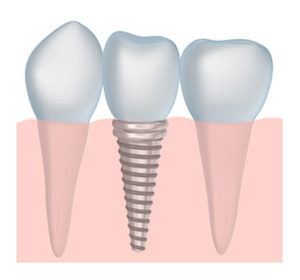 A tooth implant is a small titanium rod that is placed into your gums and jaw as a replacement tooth root. The rod fuses with your jawbone within 3-6 months. This tooth implant is then topped with a dental crown. The combination of the tooth implant and the dental crown gives you a “new” tooth where a gap was before. What are the advantages of getting an implant dentistry procedure at Vanguard Dental Group? 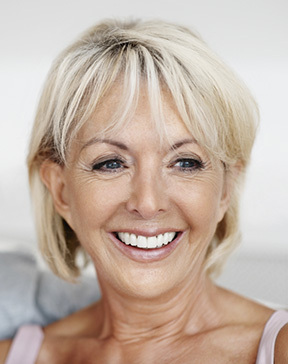 Dental implants are remarkably sturdy, durable and will probably last your whole lifetime. A tooth implant looks just like a natural tooth, so laugh and smile freely. We color match and mold the dental crown to look completely natural. Dental implants can give you that full, complete mouth feeling and can usually rectify any speaking problems you have from your missing teeth. We both place and restore implants so you benefit from having the entire implant dentistry procedure all done in one place. A periodontist actually comes to the office to place the dental implants. We have conebeam technology and a surgical microscope to identify the optimum location for each tooth implant and then place the dental implants precisely. We also place dental implant supported dentures, including placing full dentures on just 4 dental implants that lets you have a full set of teeth even while your implants heal. If you are interested in knowing more about implant dentistry or would like a tooth implant, call us today! We want to give you the most healthy, beautiful smile possible if you are in the Derry NH area, including Londonderry and Windham NH!